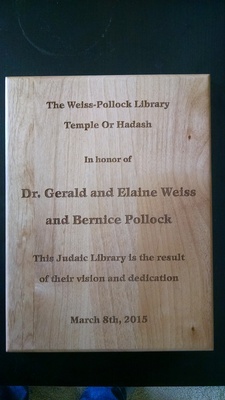 The Weiss-Pollock Library of Temple Or Hadash was dedicated on March 8, 2015. Located in a classroom at Rivendell School in Fort Collins (the site of our religious school), we have a collection of more than 125 books relating to Judaism, many of which are autographed by the author. In addition to books on history and Jewish practices, there are cookbooks, childrens’ books, biographies and books on comparative religion. Most books are from the personal library of members Elaine and Dr. Gerald Weiss. Temple member Bernice Pollock (may her memory be a blessing) was instrumental in creating and organizing the library. In addition, we have numerous personal travel books that represent the Weisses’ many international trips. Books may be checked out by simply signing our book log. We will be accepting donations of books toward the end of 2015.